A Fort Worth man volunteered to help in Houston, and then the cops detained his father in North Dakota. 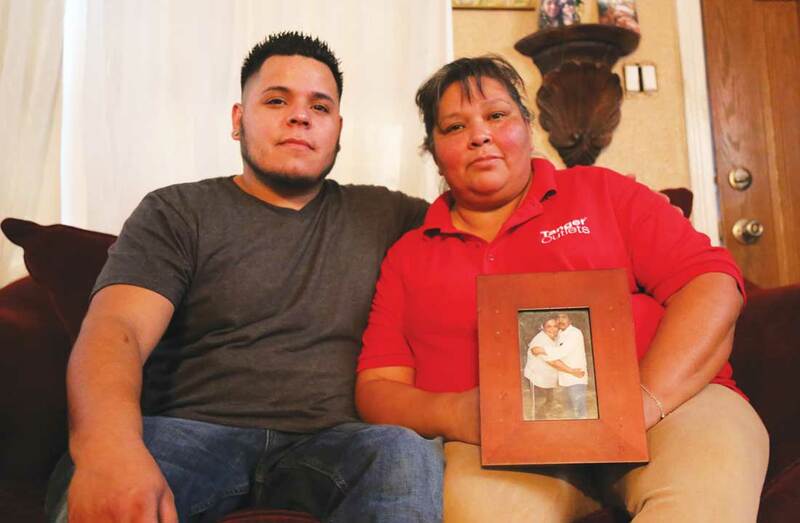 Paul Rodriguez and his family were worried about their mother’s health. Angela Rodriguez was recovering from her second stroke in four years. Family members took turns looking after her as she got better. Paul and some friends had scheduled a trip to Colorado toward the end of his mother’s recovery. This was in August, around the time Hurricane Harvey struck Southeast Texas and other regions. Paul said he felt mixed emotions watching the news and seeing the devastation left by the storm. Paul said he couldn’t take the trip knowing Texas families were in need of help, especially when he almost lost his own mother. Instead of going to Colorado for vacation, he decided to drive to Houston to volunteer. Convincing his buddies wasn’t difficult. They were thinking the same thing. Paul Rodriguez and his mother, Angela Rodriguez. 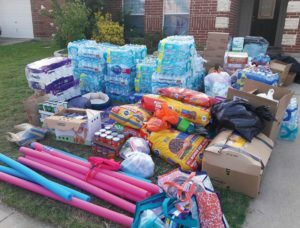 After collecting goods and other kinds of donations from friends in Fort Worth, Paul’s little gang of do-gooders loaded up a pickup truck and trailer and left for Houston. They described long workdays, horrible scenes of ruined homes, meeting other friendly volunteers, and sleeping in their vehicle without anywhere to take a shower for days. Angus Bueno, the driver, said he and his friends did everything they could to deliver their donations all around and he was amazed by the kindness they witnessed from people all over Texas. “It still affects me now, and I get choked up thinking about it,” Bueno said. Feeling inspired, the group continued to volunteer upon returning to Fort Worth. They picked up trash around parks, motivating others with Facebook photos of their work and hashtags such as #trashbash. Paul’s 10-year-old daughter became involved. Helping his community, city, state, and country made him feel great, he said. Then came North Dakota. Paul (center) and his friends canceled a Colorado vacation to help with post-Harvey recovery efforts in Houston. Photo by Diamon Garza. Days before Thanksgiving, Paul received a call at work from his mother informing him that his stepfather, who raised him since he was 5 and who Paul considers his true father, was detained by police while working in North Dakota. Paul was shocked, sad, and angry. He couldn’t hold in his emotions. Paul’s father, Lorenzo Zavala-Hernandez, has been living in the United States since 1992 and has been in a relationship with Angela for more than 20 years. They have three children together, but Zavala has always been a father to Paul and to Angela’s other children as well. He drives to North Dakota and other states a few times a year, spending anywhere from a few weeks to several months fulfilling roofing contracts. North Dakota police stopped Zavala in Mandan, a city just outside Bismarck, after he made a U-turn across the median to pick up a part he had forgotten, according to police documets. He told Angela on the phone he believes he was pulled over not because of the U-turn but because the officer thought he was trying to avoid passing him. Zavala overheard the officer saying he was going to contact the U.S. Border Patrol and that they were likely going to detain him and a coworker who was with Zavala at the time. Zavala tried to find documents in his truck showing he was in the process of obtaining his citizenship but said the police officer didn’t give him a chance. Angela said she requested residency for him in December, almost as soon as Donald Trump won the presidential election. Even though Zavala’s status hadn’t been an issue before, the new administration’s rhetoric scared her. “Trump just came in, and we knew things were going to start to get ugly,” Angela said. She was right. The number of deportations has not increased, but arrests by U.S. Immigration and Customs Enforcement (ICE) increased by 30 percent in 2017, according to ICE’s most recent annual report. ICE credits the increase to Trump’s executive order “Enhancing Public Safety in the Interior of the United States” from January 25, 2017. What’s more alarming to many families like Angela’s is that more than 31,000 of the arrests were non-criminal. After finding out what happened, the Zavala family called detainment facilities in search of Zavala. At one point, one of the officers told his older daughter to stop calling. Finally Zavala called the family from Grand Forks County Correctional, a North Dakota facility closer to the U.S.-Canadian border and said he felt he was being mistreated for refusing to sign a I-286 form, a Department of Homeland Security Notice of Custody Determination. Paul was on the road once again but this time with his family, and this time they weren’t headed south. With his mother, two older sisters, and 10-year-old brother, Paul left for North Dakota hoping to bring Zavala back. They gathered all of their father’s documents and began the 18-hour drive. 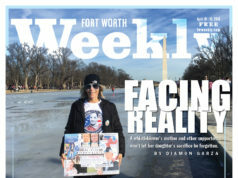 The family later said they felt prejudice toward them in every town they passed through, something they weren’t used to coming from Fort Worth. Becky said every time they walked into a gas station or stopped for a bite, the customers would stop their conversations and look at the family. “Move, Chico,” Paul recalled being told by a middle-aged woman at a fast food joint. The family felt as if they were the only people of color for miles. At one point, Angela and Becky said they overheard a hotel clerk and some guests openly talking negatively about Mexicans. Angela ignored them, but Becky, in her frustration, confronted the group, leaving them silent. She said the hotel clerk treated them better the rest of their stay. Upon arriving at the police station in Grand Forks, the family was told by officials that Zavala wasn’t there. Police tried to send them elsewhere, but the family would not allow themselves to be shunned or ignored, Paul said. Becky tried her hardest to convince the officer working the desk that her dad was there and showed him that the number Zavala called from belonged to that building. Eventually, the officer told the family their father had been located. They had a short opportunity to speak with him through a TV screen at the facility. But at the time, they weren’t given any information on how long he might be held or whether he was going to be deported. The family had already retained an attorney, even though money was going to be tight without Zavala, who was the breadwinner. The family was rocked. Paul’s youngest brother took it the hardest and cried often during and after the trip, Paul recalled. The family celebrated Thanksgiving in North Dakota. It was the first time they spent the holiday without each other. In an attempt to make the situation seem a little less dismal, Paul bought a few rotisserie chickens and sides from a local supermarket for the meal. After three days, the family had to return home, still with no word on their father’s fate. The only thing they could do was save up money to pay for legal help and a possible bond. The family’s North Texas-based attorney Carrie Nguyen said there is no absolute protection for someone who is arrested while in the process of seeking residency and that the process is more onerous for someone in this situation under the Trump administration. “It is definitely harder to negotiate with government and ask them to exercise prosecutorial discretion now,” Nguyen wrote via email. The issue of immigration has captivated headlines since Trump took office. His plan to build a wall between Mexico and the United States, his repeal of the Deferred Action for Child Arrivals (DACA), a policy that protected from deportation individuals who entered the country illegally as minors, and several other anti-immigration policies of his are causing protests and legal battles across the country. Texas is no exception. One of the fiercest battles has been over Senate Bill 4, a law obligating local governments and law enforcement entities to do the work of federal immigration officers or face a stiff penalty. Protesters rallied against the bill, especially against the “show me your papers” amendment, during the 85th legislature in Austin early last year. The bill’s opponents believed it set the precedent for discrimination against Latino citizens and non-citizens. The final day of the legislature ended in pushing, shoving, and name-calling among lawmakers. The scuffle ignited after Republican State Rep. Matt Rinaldi said to his Hispanic Democratic colleagues, “I’m glad I just called ICE to have all these people deported,” referring to the Hispanic protesters. Activists, civil rights groups, and others had packed the House. Some were forcibly removed by police. Texas’ branch of the American Civil Liberties Union said SB 4 makes everyone “less safe” and that sheriffs and police chiefs across the state had “advised the legislature not to pass the awful law.” After temporarily blocking parts of it and more hearings, the 5th Circuit Court of Appeals’ final decision is still pending as of Nov. 7, 2017. 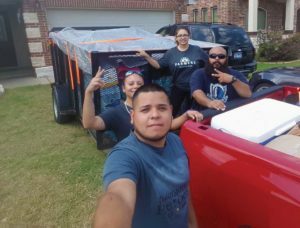 The uncertainty of immigration status in the United States and the president’s disdainful attitude toward Hispanics and other immigrants has families like Zavala’s in a vise. 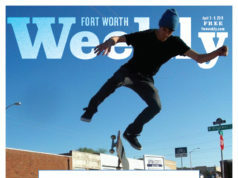 Though the family members have lived most of their lives in the Seminary and Hemphill area of South Fort Worth, a largely Hispanic neighborhood where many residents are bilingual and advertisements on stores and shops are often written Spanish, they feel now as if they are being punished simply for being Mexican in the United States. Paul and his friends collected dozens of donations to drive to Houston to help with post-Harvey recovery efforts. Photo by Diamon Garza. The ordeal impacted every member of Zavala’s family. Angela began working two jobs. Paul picked up extra hours. The children struggled while adjusting to life without their father. Even while Zavala was out on jobs, he always checked in on them, called his wife, and spoke with his kids through FaceTime. He is a funny guy by nature, Paul said, and his whimsical behavior can be seen in the photos the family shared with me. Nobody could find a serious photo of him, but there are plenty with him wearing his signature funny glasses of different colors that make his eyes look enormous. The youngest of the children had to seek counseling at school. His second oldest daughter Natali, now 16, worried whether her father would be out in time to see her graduate. She is currently receiving dual accreditation at school, earning college credits while in high school. The entire family said he is the life of the household and taught them the values that they live by. Paul, reminiscing on his time spent volunteering in Houston, said his dad raised him to care for and help others. He described his dad as a giving man who would help you change a tire in the rain. Paul accredits the charitable work he has done to the values Zavala taught him. Zavala has since been released on bond. He missed Thanksgiving, Christmas, and his daughter’s 16th birthday while being detained by Border Patrol. Now that he is out, his future is unknown. The family is struggling financially. They held a fundraiser to be able to pay the bond, with Paul cooking brisket and selling plates for donations. Together they have spent about $8,000 on his bond, attorney fees, and travel expenses, Paul said. Angela said this is just the beginning. They will need to come up with another $6,000 for other fees, $3,000 of which they will need by the end of this month. Zavala, now in a state of limbo, is struggling to decide what his next steps will be. 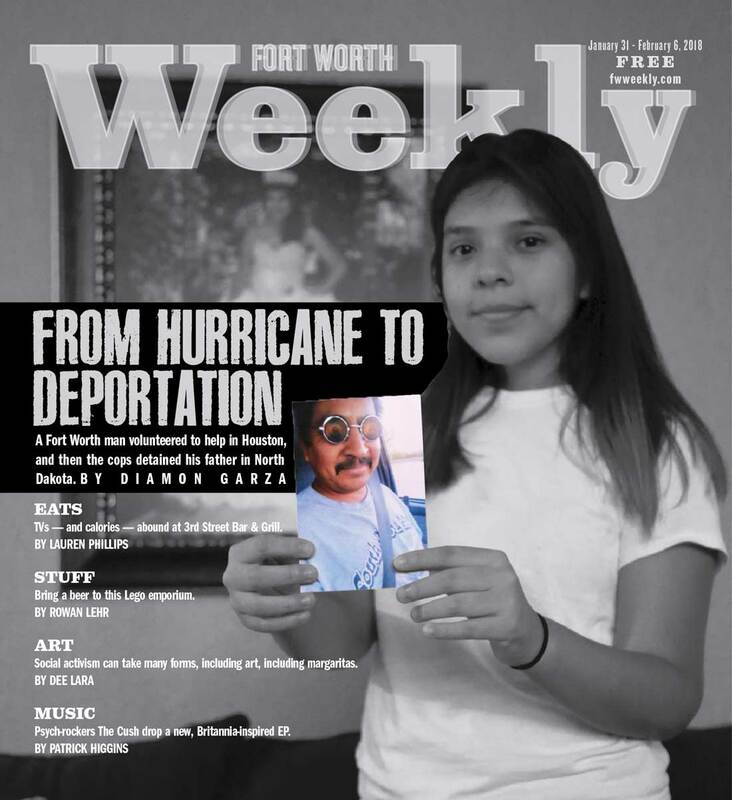 His attorney has instructed him to carry around his I-130 Petition for Alien Relative, the first step in helping a relative immigrate to the United States and obtain residency, everywhere he goes. Angela completed the document for him in December 2016. He also carries a card stating his rights, a list of instructions in case he is approached by law enforcement, and Nguyen’s contact information. These documents may help in the event that he is questioned regarding his residency status, but his protection is not guaranteed. 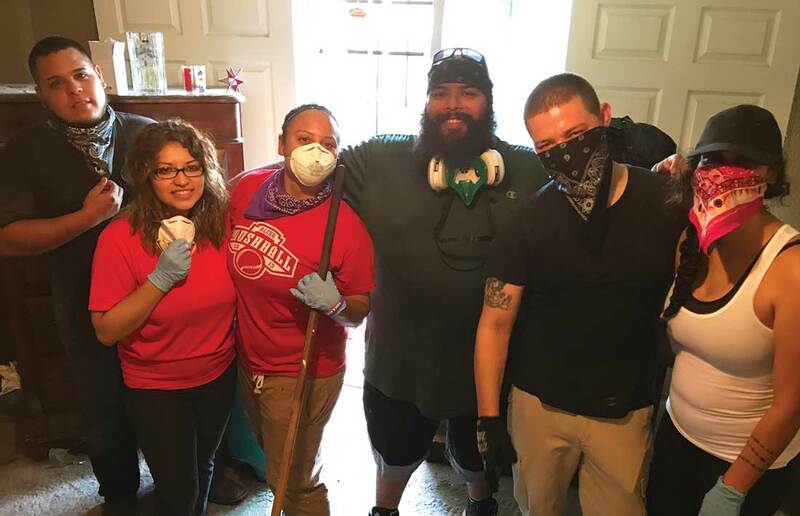 Pictured during post-Harvey recovery efforts in Houston, Angus Bueno (fourth from left) said he was amazed by the kindness that he and his friends witnessed from people all over Texas. Photo by Diamon Garza. This makes the decision to return to work for him difficult. Zavala said most of the best-paying roofing jobs for him are in North Dakota, but it’s too risky for him to drive there. Due to his family’s current financial situation, it’s a risk he said he might have to take regardless. No one knows the damage getting pulled over in North Dakota would cause to his case. Zavala said he was warned by a police officer before his arrest that things would be different under Trump and that Zavala shouldn’t continue to visit North Dakota. The family is stuck not knowing if their father will obtain his residency or be deported. His court date is set for October 2018. In the meantime, everyone in the family has to do what they can to help out with expenses. The family struggles to understand why their lives have changed so much during the past year but is thankful for the help they’ve received. This story is heartbreaking. Such a wonderful family and great citizens. Unfortunately stories like this will be told all around the country. Last night at President Trumps State of the Union speech he talked about Zetas and other Mexican gangs who terrorize our people and country. These are the people who need to be deported and picked up and sent back. But when you pull away the heart of the family the bread winner of the family and someone who goes out of his way to help others, a model citizen what is the justice in that. He had his documents. They should not have had so much problems even to get information. I feel it’s only going to get worse giving Authority’s the right to harass decent Mexican Americans legal or not. That is the real concern. I realize the Democrats want open borders and illegals voting in our elections. But there are reasons for the wall around Nancy Pelosis house. Name one nation that has open borders. What would happen to me or you if we were caught in Mexico illegally? So stop with all the race baiting and foolishness. It makes you Democrats look even worse than you already do. Every country has immigration laws. There are good people that come into this country illegally, and stories like this are heartbreaking (which is the point of the story being written). However, if you came into this country illegally, you broke a law. You are not entitled to be in this country. You knew the risk of coming here illegally, and if you get caught, the mature and respectable act is to own up to your illegal status, and leave the country that you entered into illegally. The shocking thing about this article is the fact this man had been living here illegally since 1992. He sounds like an amazing man and gives of himself to those in need, but he was here illegally for over 20 years. He made that choice, and he now is facing the repercussions. This article wants to tug at your heart strings, therefore misdirecting you from hard facts and US Federal law on immigration. 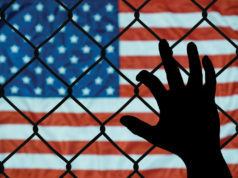 If you enter into this country illegally, you will be deported if caught….just like you would be in any other country you entered in to illegally.